A Celebration of the Life of Coach Broyles will be held this Saturday, August 19 at 2 p.m. at Bud Walton Arena on the University of Arkansas campus. The celebration is open to the public. During his 34 ½ years as Athletic Director (1973-2007), Broyles transformed the Razorbacks from a program competitive primarily in football to one of the most successful all-sports programs in the nation. His vision and leadership was the driving force behind the University of Arkansas moving to the Southeastern Conference (SEC) in 1990. The move set the stage for the program’s growth and future success while dramatically changing the landscape of intercollegiate athletics. In lieu of flowers, the family requests contributions may be made to the Frank & Barbara Broyles Foundation (BroylesFoundation.org) or Central United Methodist Church in Fayetteville. FAYETTEVILLE, Ark. 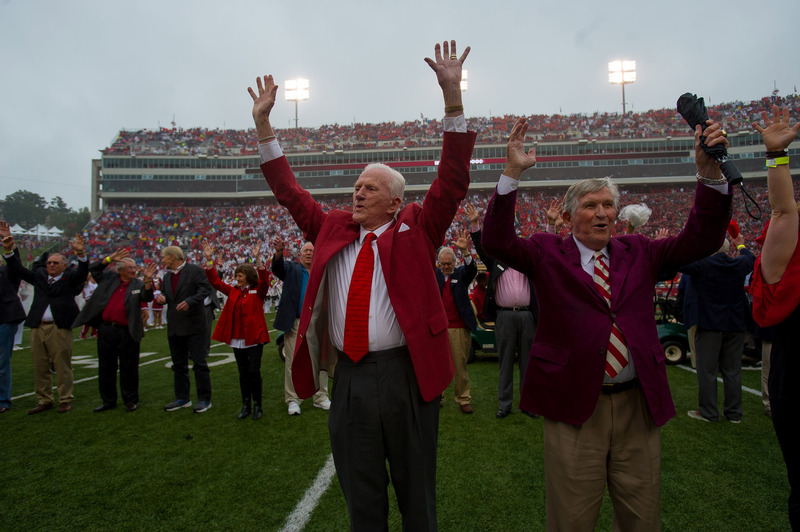 – Former coaches, players, administrators will help pay tribute in “A Celebration of the Life of Frank Broyles” on Saturday at 2 p.m. at Bud Walton Arena. The celebration is open to the public. Bud Walton Arena will open at 12:30 p.m. and those attending should enter through the north, south and west entrances. No professional video or photography equipment will be permitted and no concessions will be available. Attendees will be permitted to bring a bottle of water into the arena. Water fountains are also available on the Bud Walton Arena concourse. Free public parking will be available in the parking lots surrounding Bud Walton Arena, including Lot 56 on the corner of Martin Luther King Junior Blvd. and Razorback and Stadium Roads, on a first come first served basis with the exception of Reserved Lots 56D, 62, 64A and AD. Those with an ADA parking pass may park in Lot 60 and enter the south entrance. Attendees should consult the provided parking map for available parking lots. Former Razorback football player and Dallas Cowboys CEO Jerry Jones will join other former Razorbacks Ken Hatfield and Quinn Grovey, as well as University of Arkansas Chancellor Emeritus Dan Ferritor and Broyles’ oldest son, Jack Broyles, in paying tribute to the Razorback legend. There will also be special music from The Singing Men of Arkansas and a tribute video presentation. Former Razorback David Bazzel will serve as the emcee of the Celebration. The Celebration will be streamed live on the WatchESPN App and can be accessed through ArkansasRazorbacks.com. 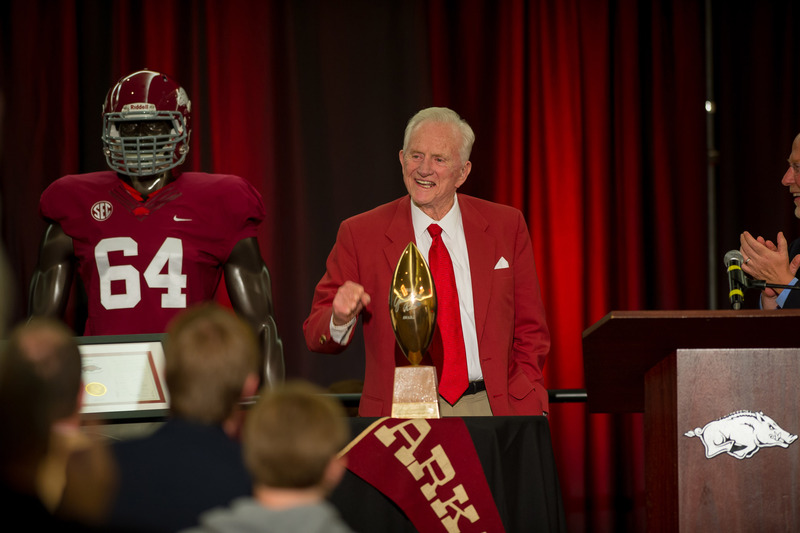 Coach Frank Broyles passed away on Monday in Fayetteville at the age of 92. Broyles spent more than a half century serving the University of Arkansas as a football coach, athletics director and goodwill ambassador.